On a break from my 'other' work I've been trying to get some new work completed. I've played with some new card stock - a little kraft work. Valentines images (Key to my Heart & Tie the Knot ring) and also The Ruin (because it just works) are now available on kraft cards. After ruminating on it from some time I've finally got another design finished. Instead of the whole array of Arthur's Seat I have focused on The Radical Road - which not only has a great name - but is a wonderful winding path up and along the Salisbury crags. It's a great walk that loops round and back through the bog in the centre. But the path that climbs up invites even the laziest of walkers. The views are incredible - and tourists and local alike can be found enjoying it all. 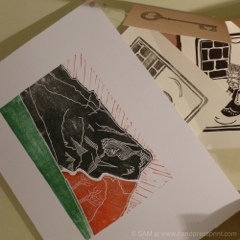 And finally - The print used to explain the linoprint process, my first limited edition print - is now available to buy too. Short - Sockless is available on white and cream - each signed and numbered. Have a look at Etsy & Folksy to see all the new work. And huge thanks to all the new followers on Twitter. 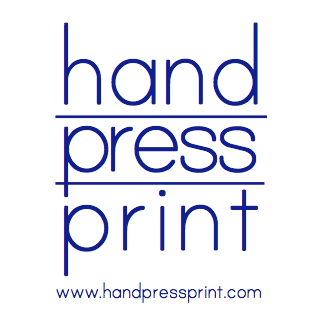 ps - when I get to 80 'likes' on Facebook there'll be a special discount code for Etsy - to be able to use the code when it launches all you have to do is 'like' Hand Press Print on Facebook.